How is your week going? I’ve been balancing a couple of my own projects, as well as working on a few for clients. I like to be busy, especially when my husband is traveling for business. It always makes the time go by faster and I’m better able to focus when he isn’t here to distract me (miss you honey!). I thought I’d give you a little sneak peek of what I currently have on the go. 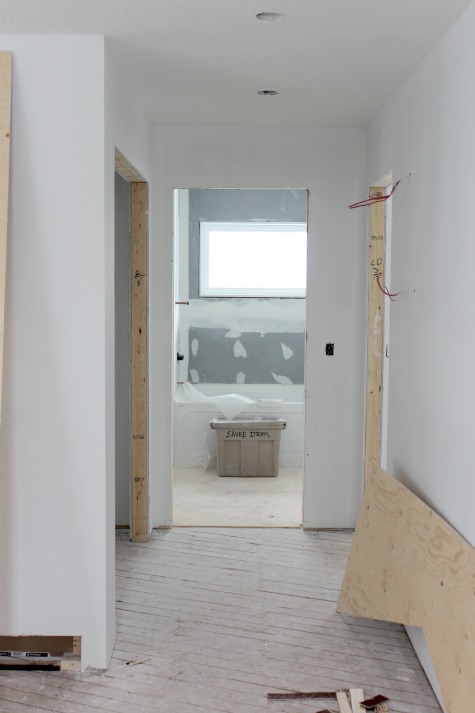 One of my clients is totally gutting a bungalow and has hired me to select many of the interior finishes, including paint colors, lighting, and tile for the kitchen backsplash, entrances, as well as three bathrooms. Most of the design decisions have been finalized and we’re waiting for the contractor to prep everything for installation. Here are a couple photos taken from the front entrance. I love how open the whole main floor is. Another project I’m involved in is selecting furniture for a new home that is currently under construction. This week we’re finalizing chairs and a sofa for the main floor living room. My client Ali has a bold sense of style and has opted for purple upholstered chairs along with a neutral sofa, both in fabrics resembling linen (minus the maintenance). I think the pop of color in an otherwise monochromatic space is going to be stunning. 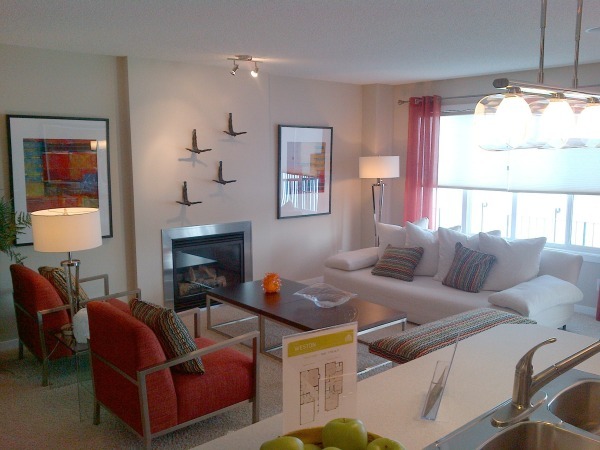 Here’s a photo of the showhome taken with my phone to give you an idea of the room (minus a few changes that were made for their particular home). In addition to client projects, my son is on semester break and I’ve enlisted his help with a few household tasks I’ve been putting off. It’s nice to have an extra set of hands when tackling any project, especially when it requires lifting and moving. I thought it would be a great opportunity to spend some quality time with him (or rather a great way for him to work off some money he borrowed from me!). 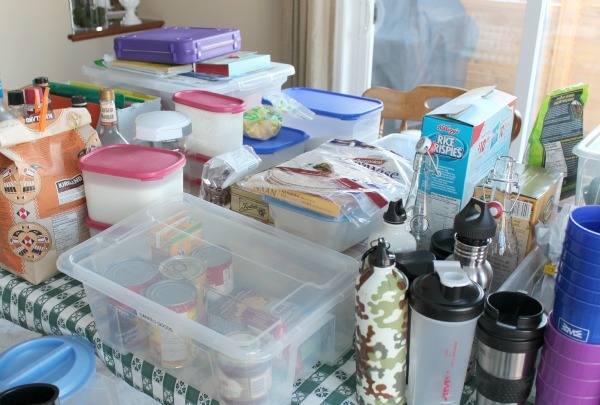 To kick things off, we completely emptied the contents of the kitchen pantry onto the table and island. I’m always amazed by how much stuff it can hold. Although the pantry could probably use a fresh coat of paint, I opted to give everything a good scrub instead since we plan on replacing the flooring soon. I last organized the pantry a couple years ago and I’ve been pretty happy with it since. However, I felt like a few things needed to be tweaked. I’ll be sharing those changes with you soon, along with a fun giveaway that will help you organize your home a little better too! Now back to addressing this mess! 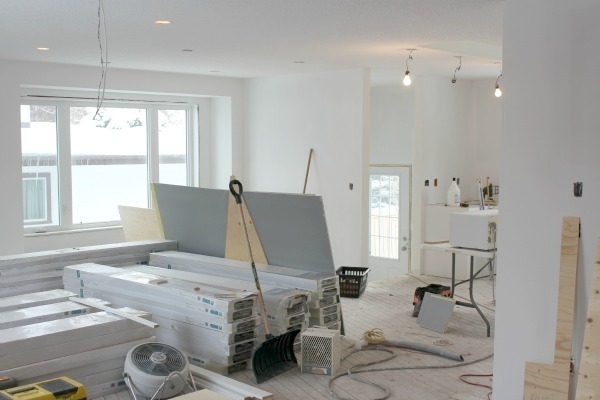 Are you working on any renovation, decorating or organizing projects in your home? Are there any projects you’ve done in the past that could use a little tweaking? We don’t have a kitchen pantry, but we have a large cupboard that used to be the most disorganized & messy cupboard ever! My husband made sliding shelves for it, and now it’s so much easier to find things and it’s great for reaching items at the back of the cupboard, which is pretty deep. I’m enjoying the projects I have on the go right now- fantastic clients! Your sliding shelves sound like a great solution. Deep cupboards can be like a black hole! Hi Shauna! We LOVE your blog! We are actually featuring your jewelry organization over at our blog http://www.adifferentkindofflair.blogspot.com! Go check it out! Thanks for being so inspirational! You are too sweet! Thanks for sharing! If it wasn’t for my client projects I wouldn’t have too much on the go. Like you, I’m not feeling overly motivated to start too much in my own house. I think it’s a case of the winter blahs, but luckily we’re taking a sunny family vacation next month. Hopefully that will bring on some renewed energy to push forward. I think that cottage is going to be amazing! And I totally agree! Monochromatic with a pop of color is always fun and exciting! Thanks Tiffany! I think the purple is going to look fantastic. It doesn’t take long for pantries to get out of hand. I don’t like waste, but we ended up having a bunch of expired stuff that was shoved to the back. I’ve made it a goal/challenge to make as many meals as I can without going to the grocery store (of course I’ll still need fresh stuff). And now that I’m hearing all of this bad stuff about cans, I’m going to try my best to weed those out. Yes, we’re renoing! We’re adding on 2 bedrooms, en-suite and an office – it’s great to work with a blank canvas, so many possibilities! Your space will look amazing I’m sure!